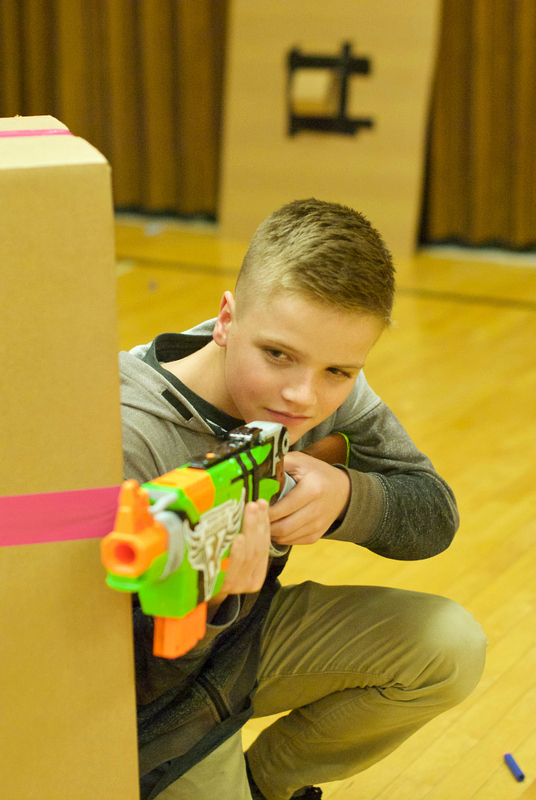 A Peek at the Fun: This Nerf gun party makes a perfect birthday party for ANY age! Whether it’s a gang of little boys or a group of teenage girls, everyone has fun at this one! 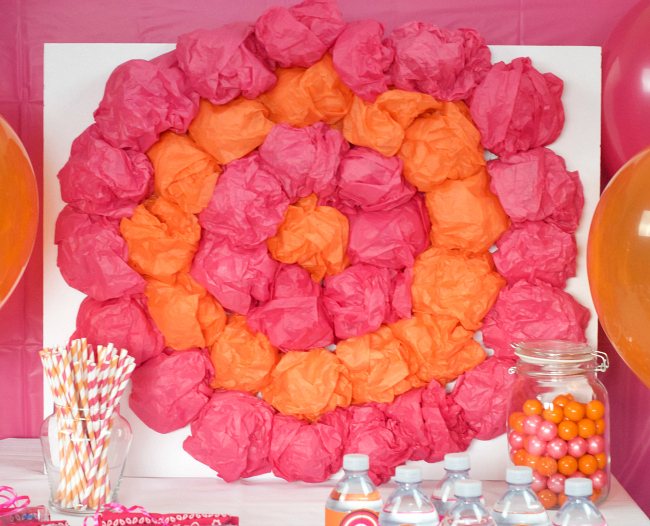 We’ve got lots of Nerf gun party ideas for you from food to decor, printables & more! With 7 little boys (ok and 2 big boys) living in our houses, you better believe there are a LOT of Nerf guns and Nerf gun bullets floating around. Someone’s always shooting someone else and we are forever finding Nerf bullets in the corners of the house, on the stairs and in the toaster. 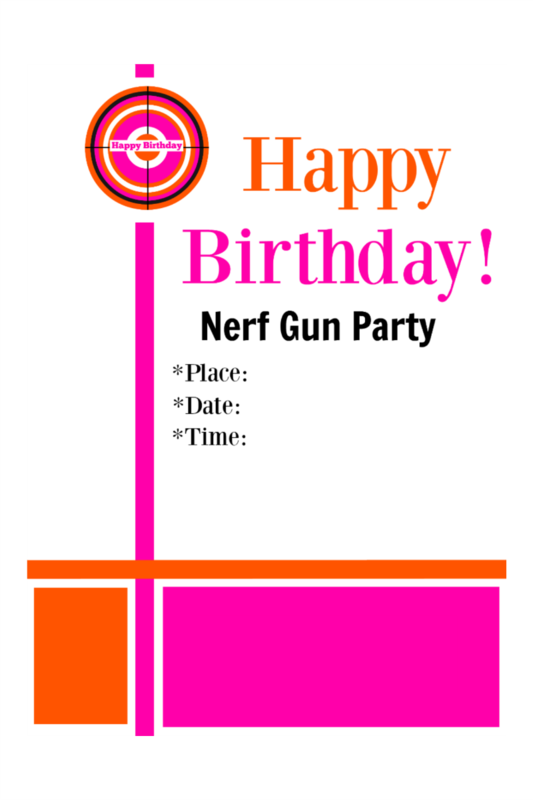 So a Nerf gun party seems like an obvious birthday party in our lives, but you might be suprised to know that this Nerf gun party was actually for a teenage girl! Seriously, a party like this could be fun for ANYONE! Check this out! 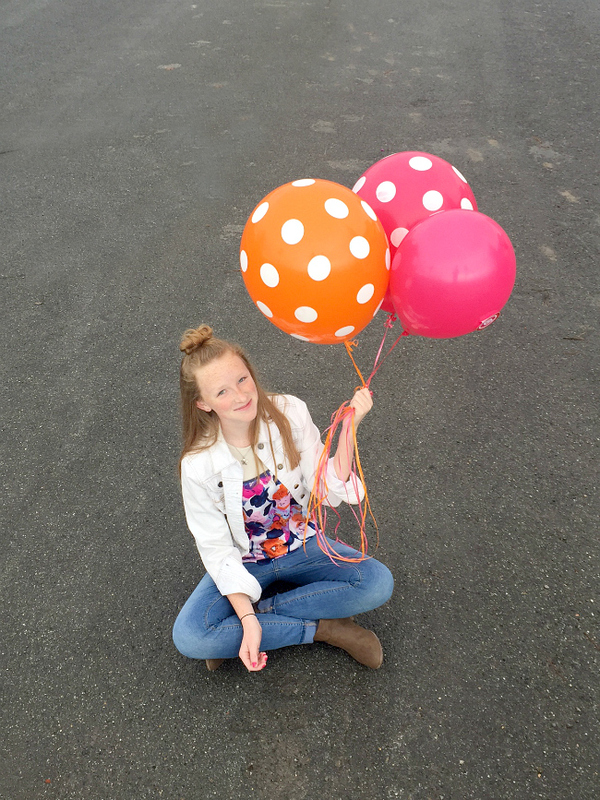 We threw Danetta’s cutie pie niece this fun Nerf gun party, and it was a hit! This is a great party idea for teenagers. 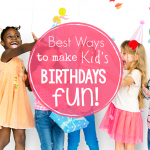 Birthday parties are so much fun, but they definitely can add up quickly and become a strain on your budget. 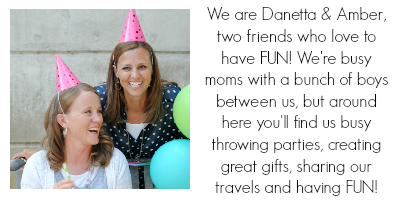 We don’t think it needs to be a financial stress to throw a fun party! 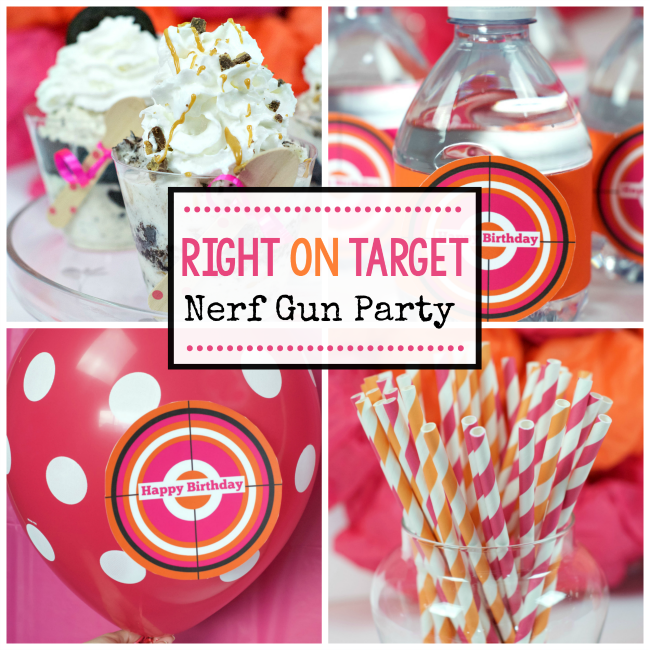 We wanted to take this Nerf gun party and show you how to do a party on a budget! 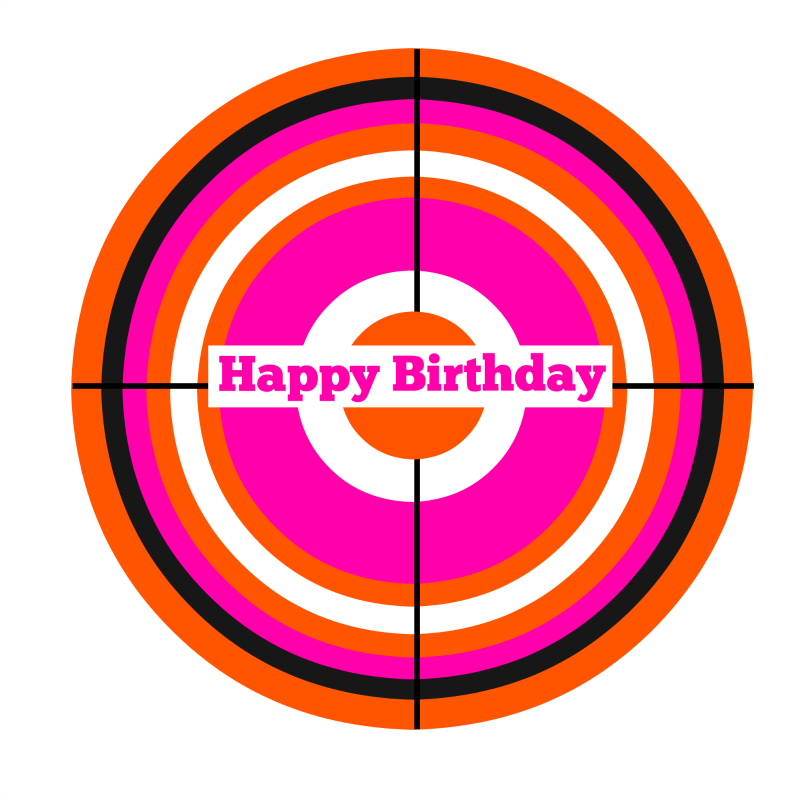 All you need is a little creativity, a little bit of time, and Fun-Squared to make a fabulous Right on Target-Nerf Gun Birthday Party for under $50 (for 12 people)! So watch for those tips throughout this post as well. We are excited to show you all of the fun pieces of this Nerf gun party because we really had a lot of fun putting it together. Have you ever made fans? 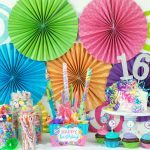 They are so simple and add a pop of color to your party. In the totals we give you at the end, we included the price of paper to make these, but you can use any extra paper you have. We really tried to include items in this party most people will have around their houses, hopefully reducing the price tag for this party even lower! 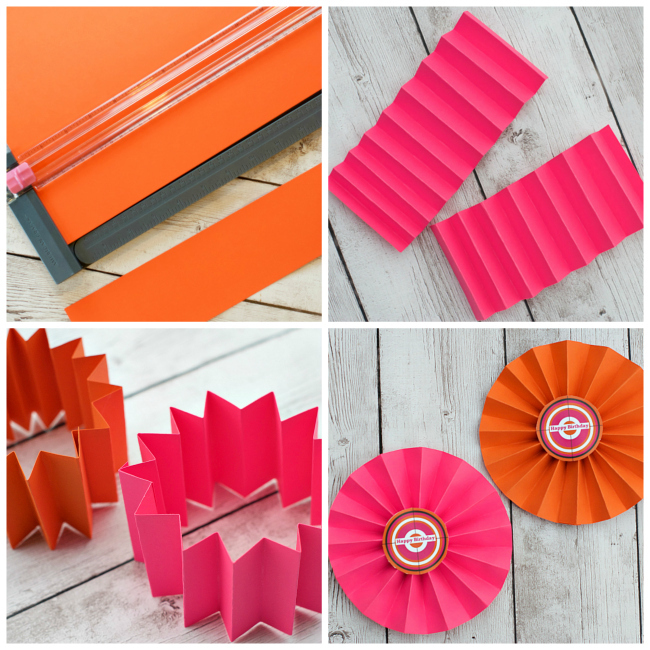 These fans are super simple to make! Fold the paper back and forth like an accordion until the entire paper is folded. Take your folded papers and glue the ends together (we used hot glue). You will glue all of the ends of the papers together until you have made a circle. 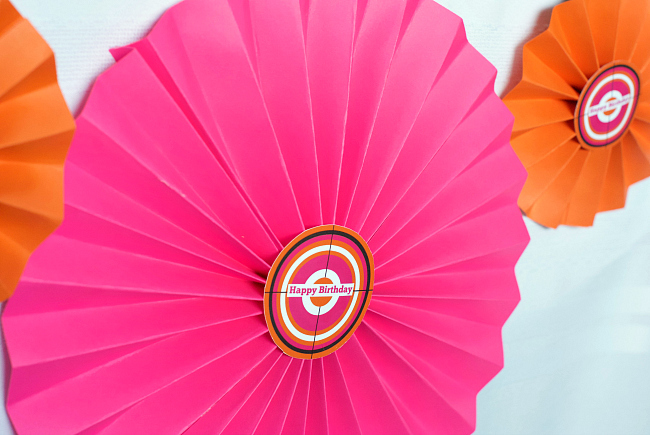 Take one side of your circle and fold it in on itself, laying it out flat. Glue a circle in the middle of your fan on both sides of the fan (this gives it stability). Then just put them all around for an easy and cheap decoration! 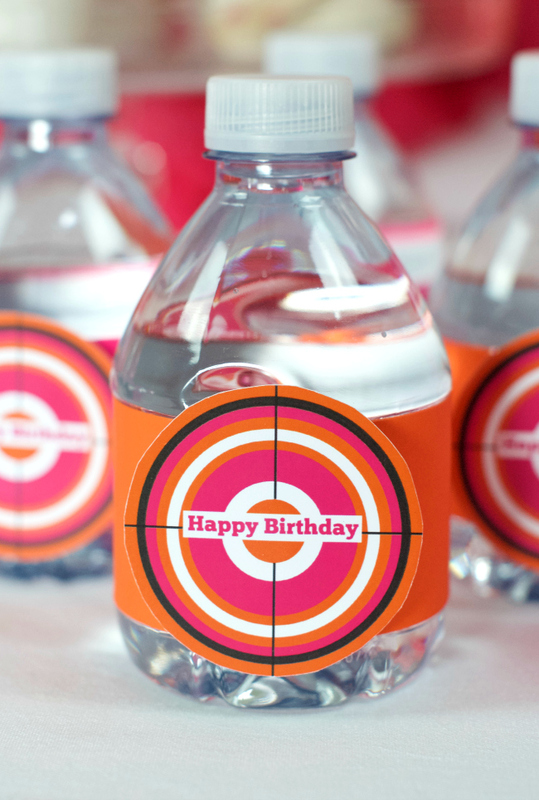 You can add some fun decorations by simply wrapping water bottles with strips of paper and adding the printable targets (download them below). They become a functional decoration! 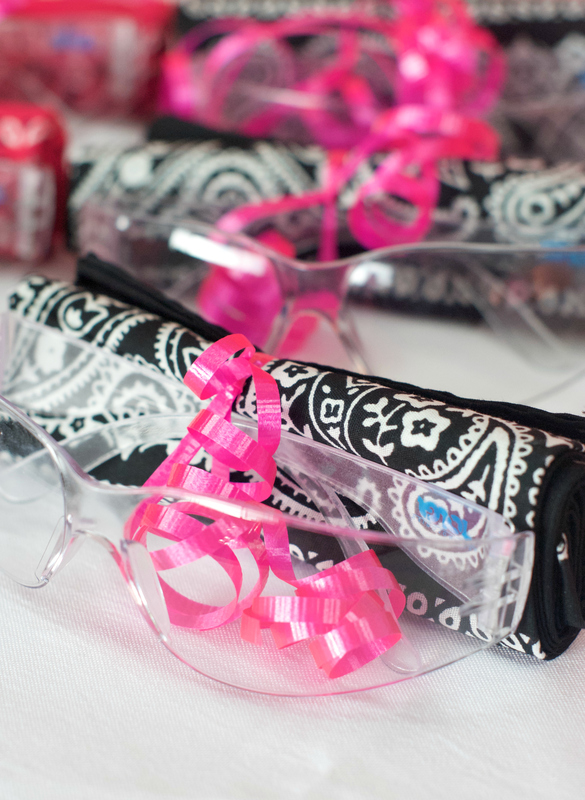 One of the must-haves for this party is safety goggles!! Make sure everyone in the room has safety glasses and they keep them on the whole time. We found these glasses on Amazon for only a dollar each! We added two different colors of bandanas to give to the two team members. If you are wanting to save money, skip this step, or use leftover strips of fabric! We love the way this backdrop came out. We wanted something that would be inexpensive and simple to make and this does both. 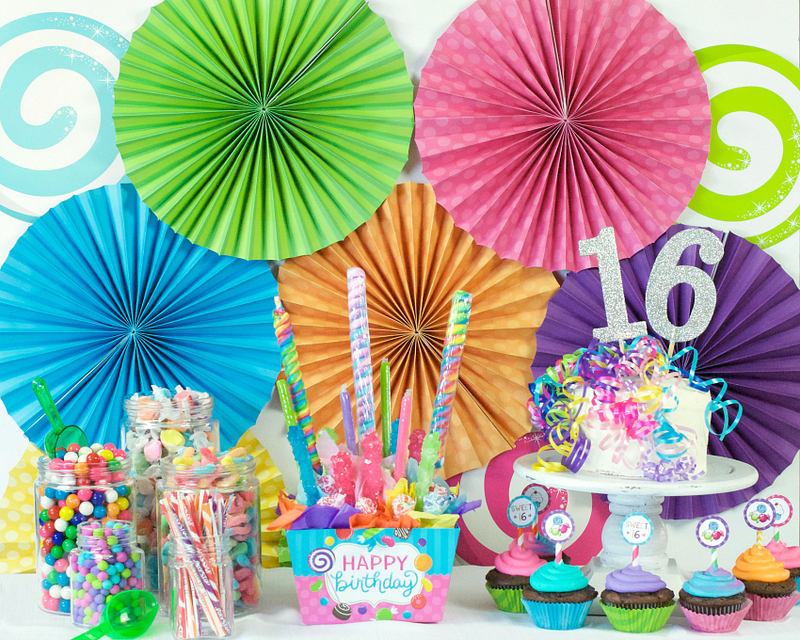 We used tissue paper, a glue gun, and a poster board and it made a fun and colorful backdrop for our party. 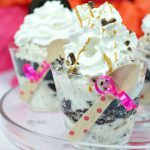 Probably the best part of this party are these ice cream cakes in a cup! 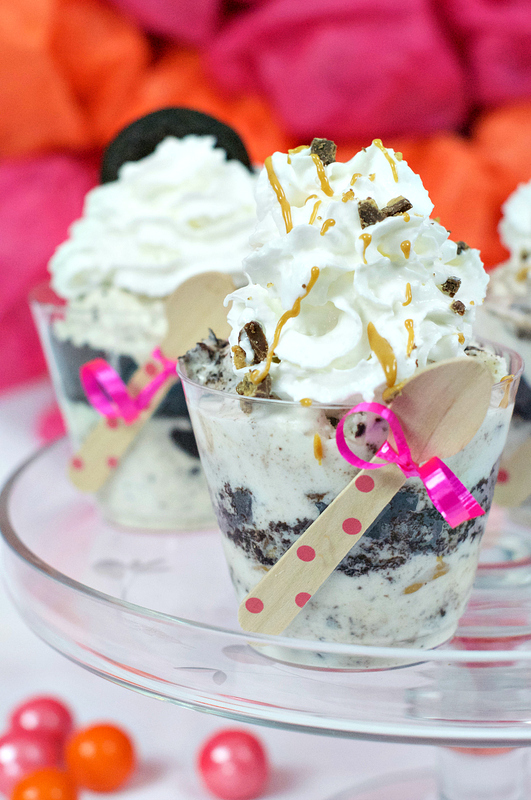 So simple to make and so yummy! We’ve got the recipe for these here. This party is spent with people shooting nerf guns at each other. 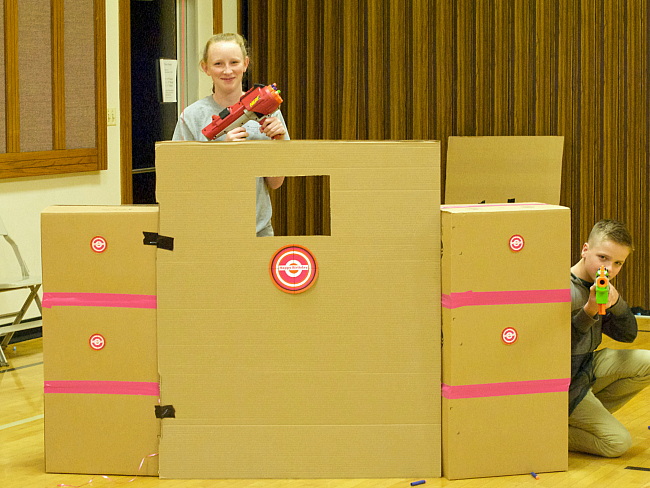 There are so many variations on how to play, but one vital point is to have shelters to hide behind to avoid getting “shot!” We made our shelters out of cardboard boxes, and they were quick and easy! All you have to do is tape boxes together so they become large enough to hide behind. We have these pictures to show you how we made this one. Check out our “how to” photos! 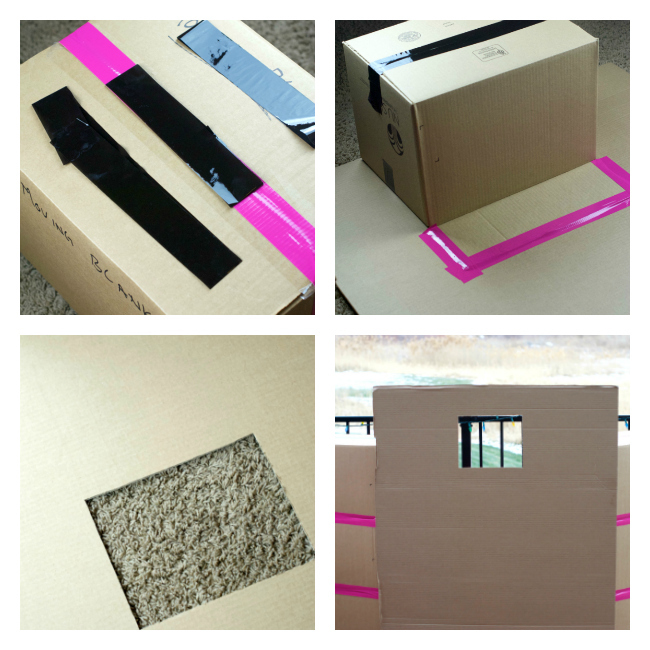 If you’ve got a large, flat piece of cardboard you can create a barrier with a window to peek out of like we did. You’ll want at least 6 of these barriers (of some variety) probably, to space out around the area you are playing in. Take a look at our barricades in action! It’s a good idea to have several variations of this game so your party goers stay interested in the activities. We arranged our arena into two sections on either side of the room. Make sure each side has an equal amount of barricades to use. It’s also a good idea to have a “referee” to call who is out (it’s sometimes hard to tell when you get hit). If you get hit with a bullet you are out and go to the side of the room. No head shots! Whoever shoots a headshot is out. Basic Two Team Game: split into two groups. Have each team on their own sides when the game starts. The referee will start the game. Each team works together to get all the members on the opposing team out by hitting them with a bullet. Last team standing wins. Capture the Flag: Again, you have two teams, each team having a flag. The game is won by capturing the opposing team’s flag and making it back to your team’s side without getting shot or you’re out. Last Man Standing: Start the game on teams but once the other team is all out, it becomes last man standing-everyone for themselves. Play until there is only one player remaining. Target Practice: Put a target on two balloons and line both teams up. Each player has a chance to shoot the target, only moving on the next player after the target has been hit. Whichever team finishes first, wins! Musical Shooting: Same rules as the Basic Two Team Game but add a twist with music. When the music is playing you are free to shoot but when the music stops you must freeze. Anyone who shoots past the music stopping is out. 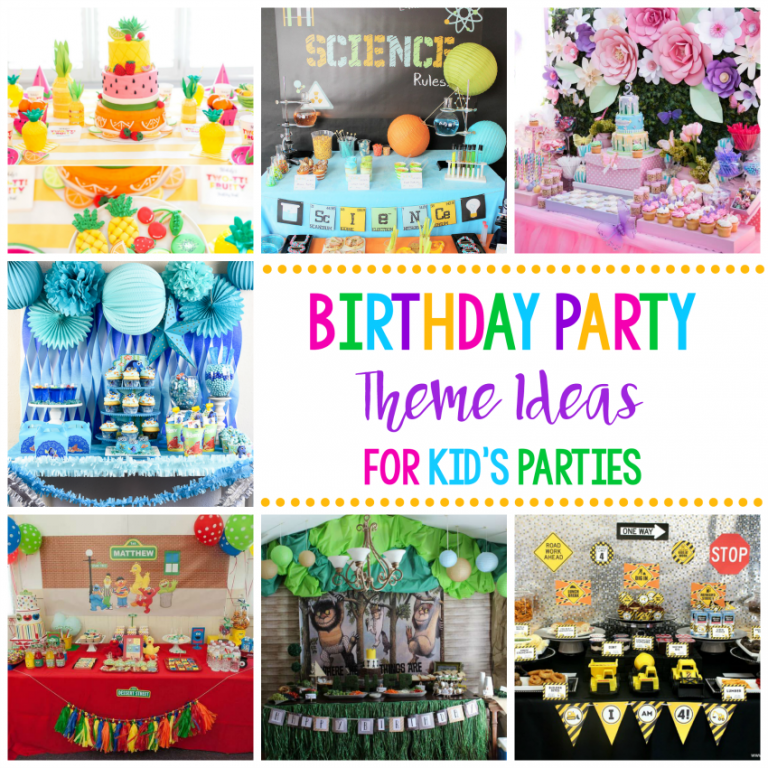 There are so many variations for this party, just get creative and have fun! Okay, lets talk money! We have given you the breakdown of everything we used for this party! Keep in mind that this is assuming you have none of these things at your home. 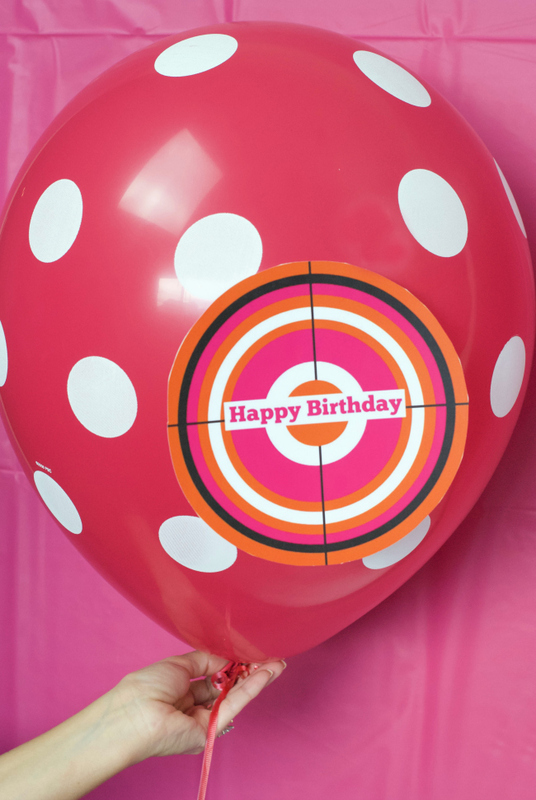 Party Extras: We did lots of fun extras so our pictures would be fun for the blog! 🙂 Because you probably aren’t blogging your party you may decide you don’t need extras! 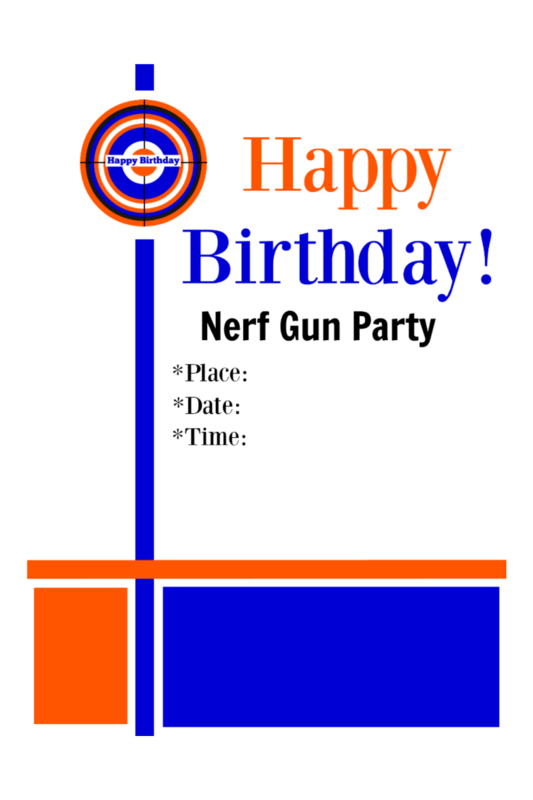 To personalize these Nerf Gun party invitations, right click and save them to your computer. If you need help adding the text, here’s a tutorial to walk you through it. And that’s it! You should have everything you need to throw this party. And if you do, take pics and tag us on social media at @FunSquaredBlog! We’d love to see it! Have FUN throwing this party Nerf gun party! This turned out so so cute! I love this! 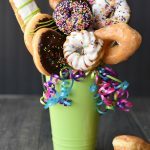 Perfect for my daughters 8th Birthday theme. Love the colors! Oh good! We hope you have a blast!